Sometimes a movie comes along that doesn't do great at the box office, but finds an audience later on and with that, a sequel can get greenlit. Dredd is sort of an extreme example of that, having barely made any money in 2012, but it has become a cult hit and fans as well as the creative team are craving a sequel to the insane action flick. After a very brief bit of hope that surfaced earlier this week, it turns out that Dredd 2 is definitely not in development right now. 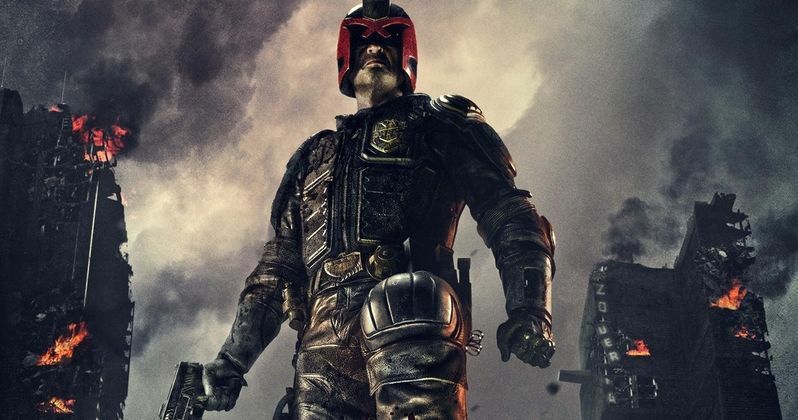 Even though, by most metrics, Dredd was a bit of a flop, Karl Urban and some of the other creative team have been championing a sequel to the movie ever since it hit streaming platforms and Blu-ray. Unfortunately, accoding to a new report from Latino Review, Dredd 2 is looking pretty dire right now. After recent rumors that a sequel was gaining some traction, producer Adi Shankar had a very blunt and very disheartening response when asked about the rumors that Dredd 2 was in-development. "Not true at all bud...unfortunately :("
Rumors started flying earlier in the week after Dredd himself, Karl Urban appeared at Denver Comic Con 2016 and made some statements about the possibility of a sequel during his panel. Karl Urban joked that the sequel would help him pay for a new house that he needs, and that there are "established creatives" working on the project. That glimmer of hope lite up the web this week, but Urban also had to jump on with Shankar and debunk almost any hope fans have of seeing Dredd 2 happening via Twitter. "Dredd update : Unfortunately a sequel is no closer to happening, options have been discussed but there is no sequel in " development " ." Urban has been actively championing Dredd 2 in the years since Dredd hit theaters, so it makes sense that he would want to have a positive tone about it, which his statements from Denver Comic Con reflect. Even though the sequel isn't "in development," it doesn't necessarily mean that Urban can't personally have "established creatives" working on the project. It is just very possible that some people looked a little bit too far into a few things that Urban said, but one can't blame him for wanting to try and generate as much positivity and buzz about the idea as possible when given the opportunity. As we learned with Deadpool last year, fans can definitely will things into existence. Dredd only made a measly $35 million total at the worldwide box office on a reported $50 million budget. That is by all accounts a big time failure for any kind of comic book adaptation, given that something like Deadpool pulled in nearly $800 million on a similar budget and with an R rating as well. Dredd did very well on Blu-ray and VOD, as well as a good run on Netflix though, and that helped lead to the demand for a sequel. Lionsgate has made it very clear that they aren't interested in making Dredd 2, but it looks like Urban isn't quite ready to give up just yet, but we are nowhere near it happening.